A bus was carrying Canadian junior hockey team which crashed at Highway 35 in Saskatchewan, about 150 miles northeast of Saskatoon, according to the Royal Canadian Mounted Police. A semi-trailer collided with the bus, left at least 15 people dead. Canadians are still in shock and are disturbed by this horrific incident. 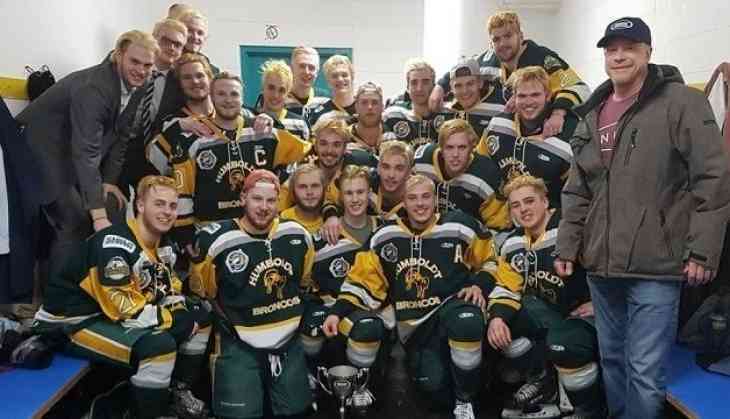 Police has identified the identities of the deceased on the bus which was carrying Humboldt Broncos hockey team. Prime Minister Justin Trudeau said, "An entire country is in shock and mourning. "This is every parent's worst nightmare. No one should ever have to see their child leave to play the sport they love and never come back." The crash occured around 5 p.m. on Friday, the hockey team was on their way to the town of Nipawin for a playoff game. The police confirmed on Saturday that there were 29 people on the Humboldt Broncos team bus, which included the driver too. Initially, the death toll was 14 but later on it rose to 15 late Saturday afternoon, police said. The other fourteen people are injured. Broncos president Kevin Garinger said, "We are heartbroken and completely devastated by the tragedy that occurred yesterday. We will never forget April 6, 2018, and we will never forget the members of our Broncos family who were taken from us and who were injured." Among those killed, included team's head coach and captain. A radio announcer for the team had also died in the crash. The Canadian authorities said they are not yet ready to release the names of victims. According to the RCMP, the driver of the tractor-trailer was not injured and was not in custody. Bill Chow, the president of the Saskatchewan Junior Hockey League said, "I don't have a lot to say other than- . . ." He said, pausing for several seconds as he began to cry. " . . . other than the worst nightmare has happened." The junior league team is based in Humboldt, a small city about 120 miles south of Nipawin with a population of nearly 6,000 people.